PureCircle has nearly 400 patents and patents pending covering its proprietary stevia technology. As one of the world’s largest suppliers of stevia sweeteners and flavors to the global beverage and food industries, the company uses significant amounts of stevia in producing those ingredients. The announced new ingredients will make PureCircle’s stevia use more efficient, as it will spread the cost of stevia raw material across the newly expanded array of ingredients sold by the company. PureCircle will continue to provide ingredients to its customers at price points that are cost-effective for them. In addition, as all of these types of ingredients are in high demand by global F&B companies, PureCircle will now be able to offer them a portfolio of ingredients from the stevia plant. “This further enhances our efficient use of each stevia leaf so that we can provide the best-tasting stevia leaf sweeteners and flavors cost-effectively to our customers,” he tells FoodIngredientsFirst. “We are constantly engaging in stevia R&D, and though we have no further announcements now, it is safe to assume that there will be more stevia advances from PureCircle as time goes on. The technologies to produce all the products PureCircle sells are covered by patents applied for patents and other intellectual property,” he explains. “PureCircle will continue to unlock everything this marvel of nature [stevia] has to offer, and leverage our expertise and innovation to provide unparalleled support to our customers as they develop zero- and low-calories beverage and food products and other products using stevia,” adds Malsagov. The technologies to produce PureCircle products are covered by patents, applied for patents and other intellectual property. PureCircle’s global array of patents are the result of its advanced innovation, research and development work with stevia and its investment therein. As a result of that, PureCircle has been granted more than 130 stevia-related patents. These patents – plus more than 250 patents pending and other valuable intellectual property – are directed to a wide range of stevia-related products and processes, says PureCircle. Globally, stevia use and activity is growing. 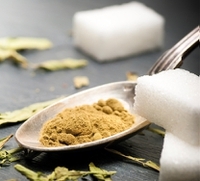 Recent PureCircle advances enable the company to significantly boost production of high-grade stevia sweeteners – such as Reb M and Reb D – which have the most sugar-like taste and are highly sought after by food and beverage companies. That means PureCircle can supply stevia sweeteners in amounts that customers need as they expand the use of stevia ingredients. The story of stevia is evolving. Not long ago, it was viewed as a plant-based, zero-calorie, single-ingredient sweetener which worked well in some beverage and food applications. Today PureCircle offers a range of stevia leaf sweetener ingredients, including Reb M, with sugar-like taste and zero calories. Food and beverage companies have an increasing need for such an ingredient, because consumers, health experts and governments have become increasingly concerned about obesity and diabetes, and consumers have become increasingly health conscious.